If you set-up pipe and drape in various locations of your facility and are carrying it by hand every time, you're working harder than you have to! Our pipe and drape storage solutions are easy to implement, hassle-free, and make great time savers. Pipe and drape storage carts feature durable solid steel frames with bolted-on casters (casters are the part of the cart that the wheel is placed into). Some companies weld their casters directly on to their cart, making replacement expensive and very difficult! By having the caster bolted on, replacing a wheel or even the entire caster (if it ever becomes damaged) is extremely easy. Pipe and drape storage carts come in a variety of styles and sizes to suit your needs, and custom carts can also be built upon request. Don't use enough pipe and drape to need a cart? No problem! Our pipe and drape canvas storage bags are a perfect solution for those with less pipe and drape pieces. 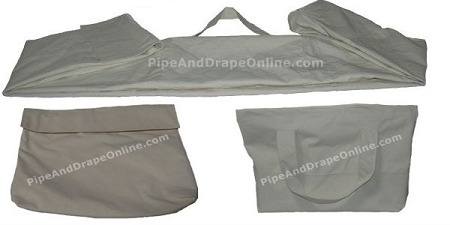 Our pipe and drape bags are constructed of heavy duty canvas for maximum durability. Party Cart holds up to 250 linear feet of pipe and drape. Party Cart Plus holds up to 250 linear feet of in-line booths (it's basically the Party Cart, but with a section for storing the 3'H uprights used as the booth walls). 8' Combo Cart holds up to 75 uprights and bases. Slip-Fit 25 Booth Cart holds up to 25 in-line booths (but not the drape). Storage Bags are available by the piece (base bag, pipe bag, or drape bag), or as a set of all 3 with a discount for buying the set.